Successfully Added 7-Inch Rear View Mirror – Multimedia Support, SD Card Slot, USB Input, Bluetooth, Hands Free Calls, 1080p Support to your Shopping Cart. This multimedia rear view mirror for in your car allows passengers to watch films and series while driving along in your vehicle. On its beautiful 7-Inch display, this car media player treats you to crisp visuals and stunning details. Simply insert the media of your liking through SD or USB, and you’ll be ready to go. 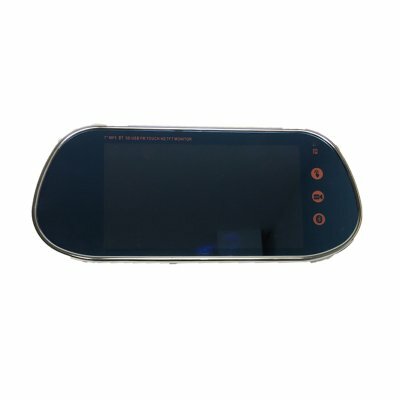 The car media player comes with a simple to use touch screen that allows you to easily browse through all its features. Additionally, the car media player can also be controlled via a remote control from the back seat of your car. With its Bluetooth support, this rear view car media player lets you pair your smartphone with your car accessory. Thanks to this, you’ll be able to listen to your favorite songs or engage in hands free phone calls while on the road. The media player supports a Full-HD 1080p resolution so you can be guaranteed it plays all the latest movies. With its 16:9 and 4:3 aspect ratios, this car media player lets you enjoy both classic and modern films without experiencing any loss of quality. If you’re looking for a stylish car accessory to keep your passengers entertained on the road, this beauty is perfect for you.